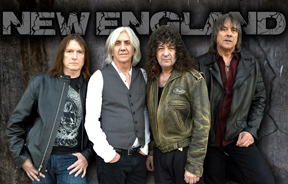 New England features all original members: guitarist/vocalist John Fannon, drummer/vocalist Hirsh Gardner, keyboardist/vocalist Jimmy Waldo and bassist Gary Shea. In 1979, they broke out of the Boston area and onto the international scene with the release of their self-titled debut album on Infinity/MCA. Their first single “Don’t Ever Wanna Lose Ya” became a national hit and cracked the Billboard Top 30. Produced by Mike Stone and Paul Stanley (Kiss), the album was followed up on a North American tour with Kiss and as a special guest of Journey / ACDC throughout 1979. They continued touring for the next several years with the likes of Cheap Trick, Styx, Journey and many more. Two additional studio albums followed, "Explorer Suite" and "Walking Wild," which was produced by Todd Rundgren. New England has accumulated an extraordinary catalog of studio, live, compilation and solo albums. And with a brand new release under their belt, Fannon, Gardner, Waldo and Shea, the orginal four, have a major tour ahead of them. Old and new fans alike will not want to miss this one. * VIP tickets are available online and include: meet and greet, autographs, photos with the band, an autographed CD and front-table seats. Opening for NEW ENGLAND will be Guitarist /Vocalist Dave Hines who's thrilled audiences in bands across the nation and is well known for his intimate performances here on the east coast.